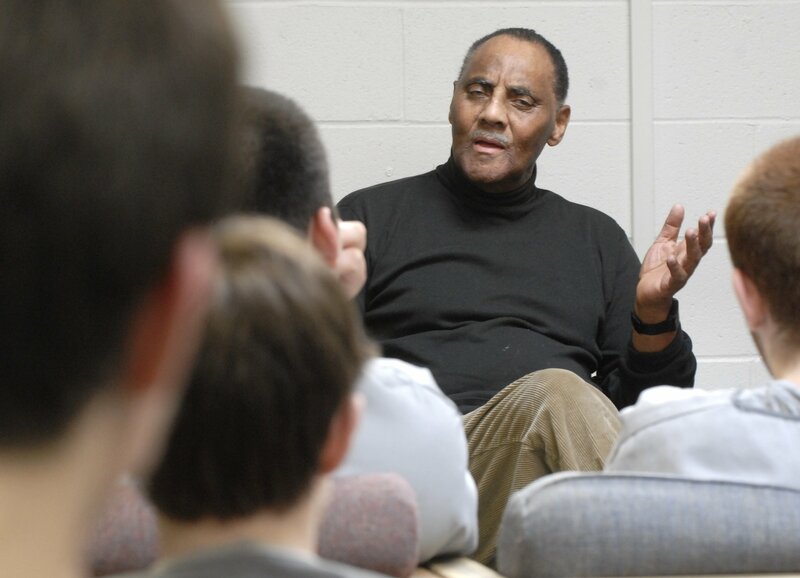 VEP veterans speak in middle and high school classes, and at colleges. The speakers provide first-person insight into events during WWII, Vietnam, Desert Storm and other wars that bring them to life. 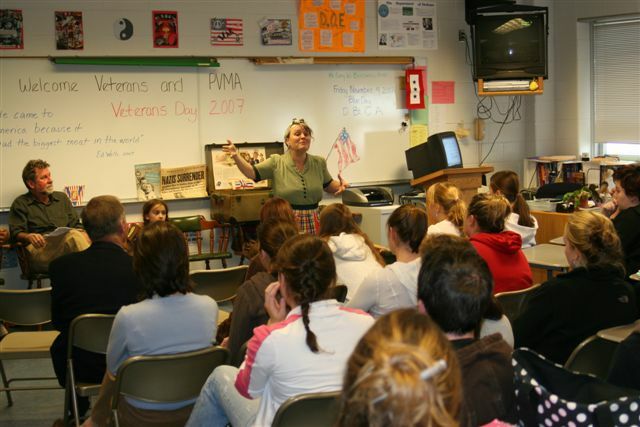 Veterans also can bring informed perspective into classroom discussions of current international conflicts. VEP veterans’ stories de-glorify combat and help young people to think critically about the realities and costs of war, and to comprehend the challenges and problems that may follow a veteran after returning from the war zone. It’s like having people step out of the pages of history books and into the classroom… Students can see the people who were actually involved in making history. 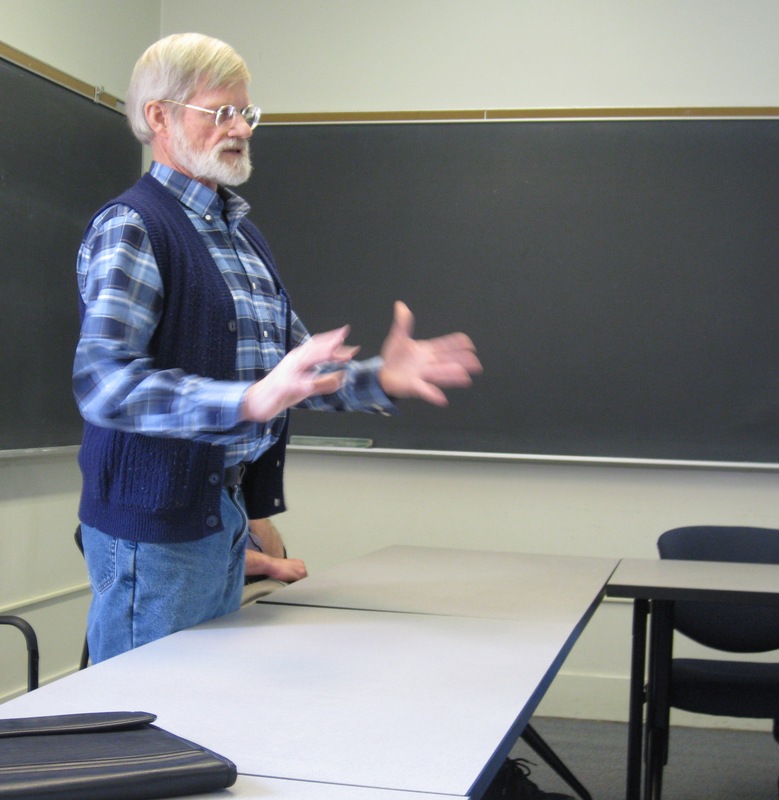 Richard Sinkoski, Social Studies Chair (retired), Pathfinder Regional Vocational H.S. 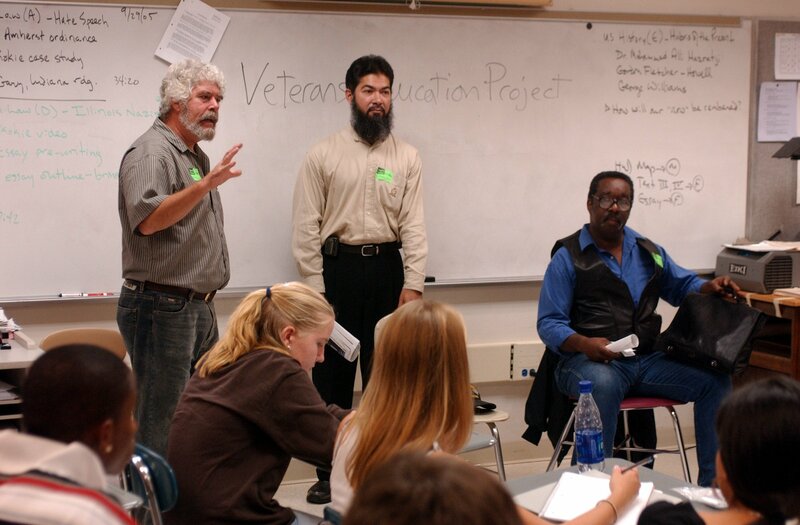 When veterans from the VEP enter the classroom and share their innermost experiences, firsthand, the students are changed forever. Rarely in their experience have our students experienced such a powerful act of witness: You honored them with your courage, and with the truth. To approach a group of unknown teens and offer them so much is profound and moving, very much so. Thank you for you presence among us and for the work you are doing in the world. I appreciate your speech more so that most anything else our class saw or did this year. Five of my uncles fought in Vietnam. One of them was killed in action, another missing in action. I never met them and never heard their story. The other three have never said a word about it to nay of my family. Hearing you was the first time I’ve heard a vet talk about the war, and it really hit home for me. I would like to truly thank you for your time, and for sharing your perspective with us. I deeply appreciate it. It really laid out a raw reality that isn’t often acknowledged (in my experience) as it should be. I think this type of talk should be heard by everyone, so that people really get to hear multiple sides to situations and would encourage more independent thinking and opinions. I felt informed and I thought a lot about the differences from what you hear and see in the media and what I was told. I liked how he was down to earth. I really felt that he knew how to come to our level to get his point across. I got a very good idea of his experience. It just made me think about how much the media influences us and how much they hold back from us. I really liked how he made me realize how ignorant I am about the war. It defiantly motivated me to educate myself more. Some veterans share their stories in VEP’s innovative school violence and substance abuse prevention programs for at-risk teenagers. We also provide prevention programming to youth groups and in juvenile jails. Many of these veteran speakers have struggled with post-combat trauma and related problems, such as anger, alienation, addiction and homelessness. When they share their stories of coping with the long term consequences of violence and substance abuse, youth listen, learn and start to think about alternatives. The veterans also provide teens with role models who have experienced hard times as a result of violence and/or drugs, and who have overcome significant challenges. VEP’s innovative prevention programs have earned citations from the Congressional Black Caucus of the U.S. Congress and the National Council on Crime and Delinquency. The veterans are able to help students to recognize the parallels between overseas’ battlefields and the war some youth face on the streets… [The veterans’ stories] enable our students to understand how violence and abuse affects them, and the impacts and long-term consequences of their actions. 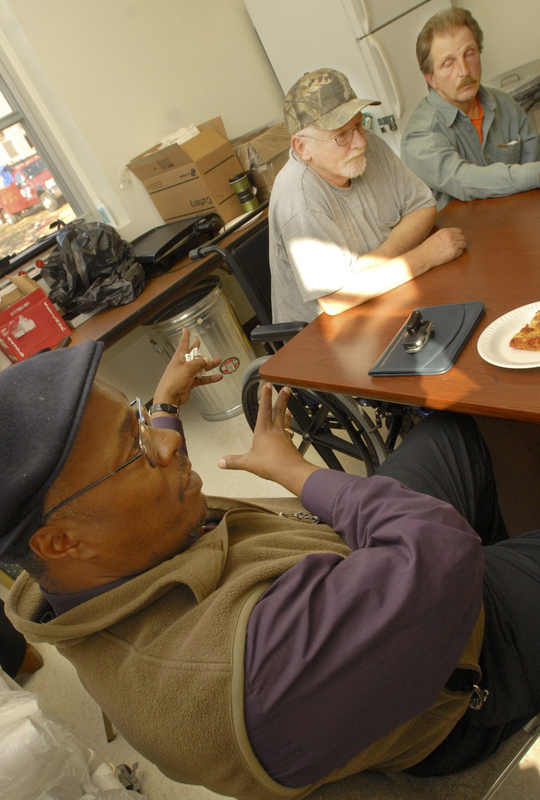 We’ll be talking about the issues these veterans raised all week in class. We hear from our teachers and parents all the time “Violence is wrong’… How could they possibly understand? I give a lot more respect to the vets. They make me question violence. I believe that the direct and personal involvement of groups like VEP [with high-risk youth] is the only way to make prevention efforts a reality.